Good morning everyone!!! Today I want to share a cornbread recipe with y'all. Well let me rephrase that. I have a total of 10 cornbread recipes to share. 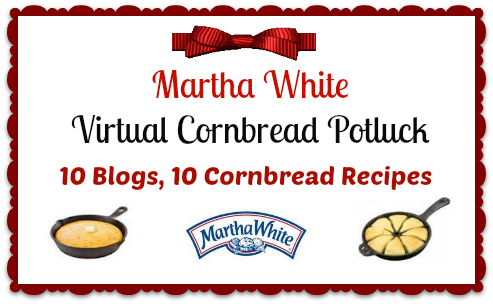 Yes my friends today some of my food blogging friends and Martha White® are hosting a Virtual Cornbread Potluck, and all of you are invited. Pull up a chair, grab a glass of sweet tea and enjoy. Oh and before I forget there just might be a little giveaway at the end of this post. Below is a list of the remaining 9 bloggers who participated and their posts. Please take a moment to visit each of these blogs featuring their cornbread creations for our Virtual Potluck. Everything looks delicious and I already see several dishes that I can't wait to try. I brought a warm and bubbly Chili Cornbread Skillet to our potluck. What goes better with cornbread than chili! This recipe gives you the best of both worlds. I originally posted this recipe back in 2008, but made a few changes. This skillet meals starts with a quick beef and bean chili cooked in a cast iron skillet, a layer of shredded sharp cheddar cheese in the middle, and a sweet cornbread topping finishes it all off. There's a couple options to this skillet meal, so don't feel like you have to prepare it exactly like I did. Another variation is omit the Mexicorn and add a small can of cream style corn, and shredded cheddar cheese into the cornbread batter. If corn isn't for you just omit the corn totally it's really your own preference. I think the Mexicorn compliments the chili nicely and gives it a festive flavor. Lets get started with the step by step. To start in a large cast iron skillet (mine measured 11 in) brown ground beef, onion and garlic. Drain off any excess fat from skillet. Add tomatoes, chili mix, Mexicorn and beans; stir to combine. Turn the heat to medium and cook until mixture is hot and bubbly (about 10-15 minutes) then remove from heat. Add a bit of salt and pepper if needed. Pre-heat oven to 400 degrees. Mix corn bread mix according to package instructions (adding the milk & eggs) and set aside. Sprinkle 1 cup shredded cheddar cheese over the chili mixture, and then pour the cornbread batter evenly over the top. Bake at 400 degrees for 20 -25 min. Be sure to check chili-cornbread as it cooks making sure it doesn’t get too brown. Cornbread should be golden brown on top. You'll know the dish is ready when the mixture is bubbly and the cornbread is baked through. Scoop into bowls and serve. Garnish with extra shredded cheese, sour cream and green onions. In a large (11 in) cast iron skillet brown ground beef, onion and garlic. Drain excess fat from skillet. Add tomatoes, chili mix, Mexicorn and beans; stir to combine. Turn the heat to medium and cook until mixture is hot and bubbly (about 10-15 minutes) then remove from heat. Add salt and pepper to taste. Pre-heat oven to 400 degrees. Mix corn bread mix according to package instructions and set aside. Sprinkle 1 cup shredded cheddar cheese over the chili mixture. Pour the cornbread batter evenly over the top of the chili mixture. Bake at 400 degrees for 20 -25 min. Be sure to check chili-cornbread as it cooks making sure it doesn’t get too brown. Cornbread should be golden brown on top. You'll know the dish is ready when the mixture is bubbly and the cornbread is baked through.Carefully remove skillet from oven and allow it to cool for 10 minutes before serving. Scoop into bowls and garnish with sour cream, shredded cheese and green onions. Do you have a winning cornbread recipe tucked away in your recipe file? 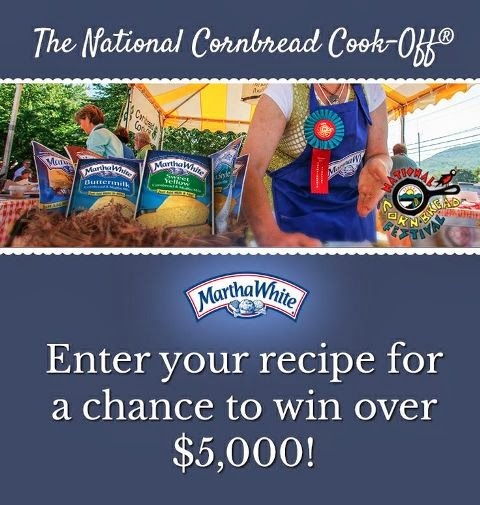 If so submit your recipe for a chance to win over $5,000 in prizes at 18th Annual National Cornbread Cook-Off and Festival. Recipes must use a Martha White Cornbread Mix of your choice. Enter by February 28, 2014. See the official rules below for complete details. Good Luck to everyone who enters. For the official rules of the Cornbread Festival competition, click here. Click here to submit your recipe to the National Cornbread Festival competition or email your recipe to Cornbread@DVL.com. Before you go I have a wonderful giveaway from the generous folks at Martha White! 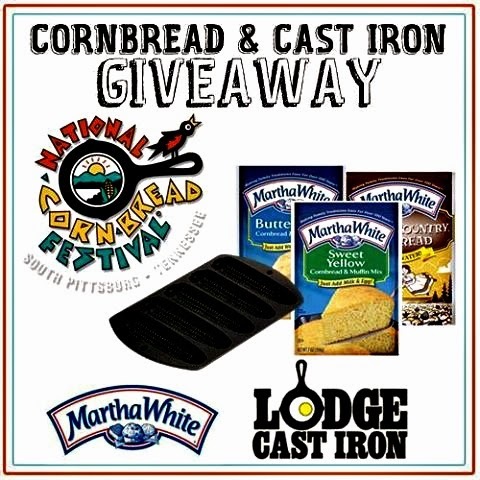 One lucky Mommy's Kitchen reader will win (1) Lodge Cast Iron Corn Stick Pan and a Variety of Martha White Cornbread Mixes!!! See below for details on how to enter. The giveaway starts Wednesday, February 12th 2014 and closes on Tuesday, February 18th 2014 at midnight (CST). Winner will be contacted by email and has 48 hours to reply and claim their prize. If you comment anonymously please include your email address in the event that you're a winner. Giveaway open to US Residents only due to shipping charges. Disclosure: This post is sponsored. I was provided with a gift card for the products purchased to make this recipe. A Martha White Prize Package was provided to use in a reader giveaway. No other compensation was received. Bush's Beans provided me with the beans to use in this recipe. I like regular cornbread with green chiles, onion and cheddar in it! Give me good old mexican cornbread any day of the week. 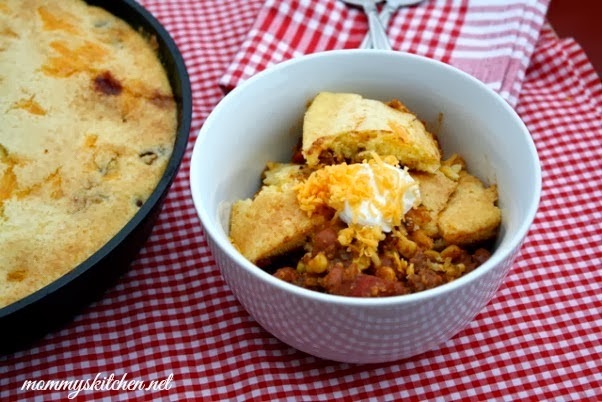 Chili and cornbread were made for each other! I had so much participating in this potluck with you. I have used Martha White regular cornmeal for years - won't buy anything else. This is a great giveaway. I love Martha White cornmeal and cast iron skillets! I love sweet cornbread warm with butter and honey. Sweet Tea!! This looks BANANAS! ;) So good! This is the perfect winter weather comfort food right here. I learned two rules for cornbread from my Granny. Rule 1 No sugar. Rule 2 Always bake cornbread in a cast iron skillet. I love sweet cornbread and with butter. Give me a side of great northern beans and I am happy! I love sweet cornbread. Slather on the butter and strawberry jam. I like regular cornbread with butter on it. I have an old cornbread recipie that uses maple syrup that is wonderful! I like a regular cornbread, but I like to slice it in half, spread on some butter and drizzle pure cane syrup over the top... yummy!!! I agree with Brandie, total BANANAS! Looks delish, my friend! I like cornbread both ways but hubby prefers sweet so most often I make sweet cornbread. I love my cornbread both ways! Brought up with it having a touch of sweetness! I love mine sweet, I would love a new cast iron, I love my old one, use it constantly. Thanks for all the great recipes. I like cornbread sweet with honey! Sweet Cornbread with jalapeno's or with corn. Delicioso me encanta con ajì,muy buena receta,abrazos y saludos. Skillet cornbread crumbled in a glass of milk. Sooo good! Regular cornbread with jalapeno and cheddar. Sweet cornbread, as a side to anything! We are a house divided! For me cornbread... The sweeter the better... My hubby says its cornbread not cake, no sugar!!!! I really love both, but sweet is just a little better!! I like both, depending on what I'm serving with it. I like to mix cornbread mix and cake mix together for a nice sweet cornbread. Sweet! With lots of butter! I like my cornbread sweet golden brown with fine onions, sweet kernel corn, green peppers and shredded cheese. Oh how the sweet cornbread is the best! Love my cornbread with a hint of sweetness, or with jalapeños and cheddar and cream corn cooked in a cast iron skillet! Yummy! I love to take Martha White Yellow Corn Bread mix add honey and then mix well set to the side.. Brown 1 lb of hamburger meat w/ taco seasoning, a can of cream corn, jalapeno chopped, 1 small onion and lots of mexican cheese mix all this in corn bread mix.. pour in Cast Iron Skillet and bake at 375 for 1 hour! MMMM GOOD!! I like regular cornbread with honey butter amd of course a bowl of Ham and Beans! I honestly like them both, BUT they have to be moist! Cooking in a cast iron skillet is the bomb! I love ALL cornbread and match it to whatever meal I am making. Especially love it with green chiles, cheddar and corn baked into it! I love sweet cornbread with butter and chili! I like sweet cornbread best with a bit of melted butter . Yum ! I love any cornbread, depends on what I'm eating with it. If I'm eating it as the bread for a meal I like it a little sweet. My favorite way to eat it is in ham and beans. Yum! I like my cornbread on the savory side with a glass of "sweet milk". Slightly sweet cornbread with butter and sliced onions. Jalapenos extra! I like both, but I like regular with milk. A tad sweet the kind the works with pepper sauce. I love my corn bread with lots of sweet cream butter. I like my cornbread the traditional way.My Grandmother told the only way to fix cornbread was in an iron skillet and always use bacon grease. I like sweet cornbread with butter! Love my corn bread " sweet" makes each meal fun an its great as a perfect snack. Being a "yankee" lol (from NY), I had no idea how to make tasty cornbread. I found Martha Stewart items and I'm still learning but do get compliments. One thing I hear often is "use an iron skillet" and still do not have one. We like sweet cornbread at our house. I always make regular cornbread! My family prefers regular over sweet :) And of course always in a cast iron skillet! I love the sweet cake-like textured cornbread....slathered in butter! I like it plain and fried in a skillet! But the proper way to consume it is chunked into a tall glass, still warm, and covered with fresh milk. Use a spoon, or you'll make a mess! Simply put, I love cornbread. I like sweet or plain, made with buttermilk or sour cream, but my favorite has to be with cheddar cheese mixed in. My favorite recipe using cornbread is probably Mexican cornbread, a little spicy and plenty of cheddar. I love cornbread and/or corn muffins. I like it a little sweet the best, but I like plain cornbread too. I like cornbread with jalapenos & corn in it; right from the oven. As long as cornmeal is the main ingredient I like it anyway I can make it! Cyndi Meyer ~ I love cornbread straight from the oven with butter on it, or with chili, or with ham and beans ~ I just love cornbread! I love my moms cornbread with lots of butter. I can nveer make it as good as she does. I like my cornbread a little on the sweet side. I always mix it with a yellow cake mix to make it sweet and light. I love really sweet cornbread with a lot of butter. I love slightly sweet cornbread cooked in my cast iron skillet that has been heated in the oven with a bit of bacon grease to create a golden crispy crust and wonderful bacon flavor! I LIKE MY CORNBREAD W/O SUGAR (NONE)IN A LODGE PAN WITH BACON DRIPPINGS SMOKIN HOT! I prefer sweet cornbread, and, if by chance there is a leftover piece, it is good for breakfast with a little milk in a bowl! I like regular cornbread with lots of butter and honey, and of course served with a side of chili. Yummy! I love sweet cornbread. I like to put honey in mine. But I do like Mexican cornbread also. I ALWAYS bake my cornbread in my cast iron skillet. Nothing else. Sweet cornbread is preferred here. I love cornbread anyway it's made! I probably make it sweet more often than not, but I love adding extras to it! I love good old southern corn bread made with bacon grease! Now if you want desert, make corn cake with sugar and top with real butter and fried apples! My favorite is sweet cornbread. We all love it with chili. All of these recipes look delish. I love pretty much any corn bread. My favorite is my grandma's Ghee's. She is from Baton Rouge and makes an amazing one. We esp like when we have leftovers and get an afternoon snack the next day. Ghee's was usually sweet corn bread. We eat regular cornbread here and have it mostly when we have a fish fry. I have to say tho that I have never, ever used a mix. All my cornbread is made from scratch using my late aunt's basic recipe. Over time I have added my own twist to it by adding some of this and some of that ingredients. Hubby likes honey on his cornbread in place of butter. I love almost any kind of cornbread but, my favorite is my nephew's! He makes it from scratch and uses jalapenos and cheese with some sour cream. Yum, yum! I like mine with cream corn mixed in it. My husband likes lots of sugar and vanilla, I tell him I can make you a cake if thats what you like. I like corn bread as a side with butter and honey. Have never tried Martha white mix but will try to find it. Regular.. warm with butter. Yum ! I love regular cornbread. I'm the only one in my household that likes cornbread, but it doesn't stop me from making it for myself! I actually like cornbread any way you fix it but my favorite is the sweet corn sticks. We love a sweeter cornbread with red beans and rice. Delightful!! Love it both ways...with additions or not. 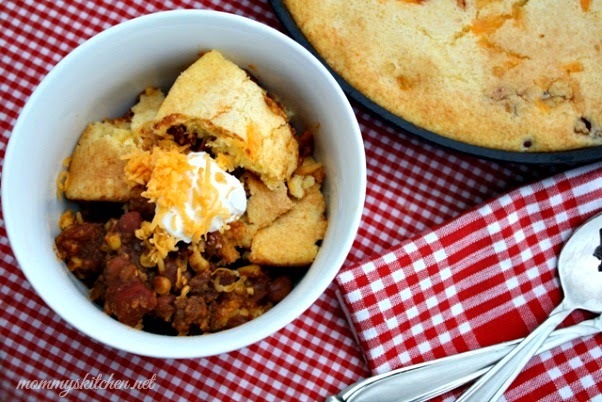 This recipe for Chili Skillet Cornbread sounds amazing. I love cornbread almost any way you can fix it. I especially love it sweet, with sour cream, cheese, and a little sugar thrown in. If you don't like cornbread, you just ain't Southern. I like it on the sweet side. I love it super moist and not too sweet! I love any kind of cornbread but if I had to choose it would be regular...especially if it is nice and brown and crispy! i love any corn bread with ham hocks and beans with fried taters and side of corn on the cob an okra best Sunday dinner ever !! Definitely Sweet Corn Bread, but wait, no..Regular! No sweet it is! I will take it anyway!!! I like cornbread any old way. Even for dessert. Has to be baked in cast iron to be the best though! I'm a regular cornbread gal. Love Martha White's white cornbread mix...especially adding in ingredients for jalapeño cheese cornbread!! Yum! MY favorite way to eat cornbread is the sweet kind and cooked in a greased cast iron skillet and then slathered with real butter and homemade blackberry jam! My Dad has used Martha White cornbread for years (as have I) and cooks this special for all of us! Kristin T taylork@cooley.edu. I have never tweeted, but would tweet this if I could! I love my cornbread with jalapenos and cheddar cheese. Only Martha White cornbread (not sweet) cooked in my 8 in. skillet with a little butter on EVERY bite!! I love any kind of cornbread but my favorite is with a little sugar. I'm a country girl! Love cornbread both ways - sweet with honey and butter or regular with cheese, onions and jalapenos! Yum, yum! My husband doesn't care for sweet cornbread, so I mostly bake it regular. That and a pot of pintos, some green onions, and he's a happy man. I love skillet cornbread with honey. Raised on sweet cornbread love it. NO sugar!! Hot and buttermilky with butter. I'll try again since I clicked anonymous. You need to get to me when I win. NO sugar. And made with buttermilk. We love to top chili with cheese then spread the corn bread batter and bake it off. So delicious! I don't know what was in Mom's cornbread but it was always served with butter, syrup and ham/bean soup. I like regular cornbread made with buttermilk & baked in a cast iron skillet. I love sweet corn bread! It's my favorite. I like regular cornbread - just like Mama always made. I love cornbread. Sweet or regular, made with good ol' buttermilk. Yum! I will eat any type of cornbread - but my favorite is at a restaurant called Mae's in Blytheville, Arkansas. It is no less than 3 1/4 - 4" tall (not exaggerating) light, yet still has that cornbread texture. Prefer not sweet. I like sweet with some dishes and Regular with others, and then spicy with yet others...let's face it I love cornbread with anything.. I like regular cormbread and milk!! Brings back old memories! I have never used any other brand of cornmeal except Martha White.I make buttermilk cornbread in a cast iron skillet with bacon grease. I like my cornbread sweet and made from scratch and then drizzled with honey and butter...yum! My family and I love sweet honey cornbread made in the cast iron skillet. Goes amazing with Cinnamon Chili and also crumbled into Beef Stew! I like both sweet and savory cornbread but if I had to choose, I would say the savory is my favorite. Just simple with butter. Nothing better! Really love both - depends on what it is going with or in. I love sweet cornbread with lots of butter. Raised on Martha White - regular cornbread. Sweet stuff just doesn't do it for me. 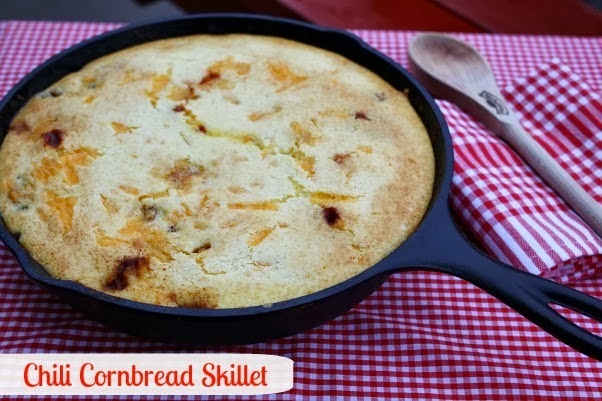 I like all kinds of cornbread and I am going to try this chili skillet method! Just remember when cooking cornbread, preheat your greased skillet or pan in the oven while it heats up before you add batter. This makes perfect cornbread everytime! I like my cornbread a little on the sweet side. I love all cornbread, but sweet would be my favorite! I also tweeted! Thanks for the chance of winning a great prize! I usually prefer regular cornbread, but this bakery near my house started making an amazing cranberry orange cornbread! I love a sweet cornbread! Sweet for me, but I love it with great northern and pinto beans and ham! I like the simple Jiffy corn bread to fix with meals or red beans and rice, but regular cornbread made from Martha White cornmeal is what I use for my cornbread dressing on holidays. I like regular cornbread. I'm from the south so I love me some milk and cornbread.